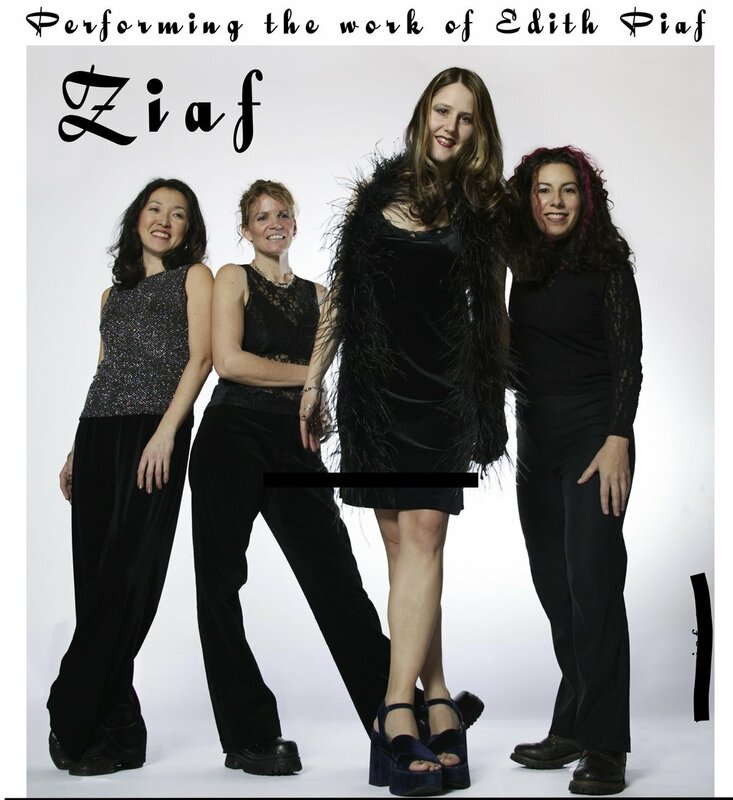 Ziaf , the band who resurrected the music of famed french chanteuse Edith Piaf, plays a one time only reunion show at the Lizard Lounge on Sept. 13, 2018 the place where their musical adventure began over 15 years ago. Featuring the original line up of Christine Zufferey (vocals) based in Paris, France and Boston based musicians Catherine Capozzi (guitar), Carol Namkoong (piano), Tamora Gooding (drums). Edith Piaf, also known as "La Môme Piaf" (the Little Sparrow), was a poignant, heartbreaking songbird, born and raised on the streets of Paris. She sang her way through a tempestuous life of lurid affairs, unsavory associations, and drug and alcohol abuse. Piaf, discovered in 1935 by a nightclub owner, impassioned audiences with her deep expressions of romance, love, grief, and joy. She died in 1963, but her spirit lives on through generations of audiences that fall in love with her fiery music and the story of her tumultuous life. Ziaf interprets Piaf’s music, putting a hip, engaging spin on Piaf’s repertoire that attracts a diverse audience of rock scene hipsters, curiosity seekers, and older people who remember the Piaf legend. Ziaf toured heavily from 2003-2010 performing to capacity audiences throughout Northeastern U.S. , Europe and Asia. Enthusiastic fans, ranging in age from 18 to 80 (including some who had seen Edith Piaf perform in the 1950's), consistently demand encores of their favorite songs at every show. They have been featured on the national radio in the U.S. with interviews and airplay on both NPR's Here and Now news show and the BBC World Program The Global Hit. In France, they were interviewed on Serge Le Vaillant's show, Sous les étoiles exactement on FranceInter. In addition to radio play, the band captured the attention of Zoom-Zoom Productions and was featured in the film/documentary Marguerite Monnot, Dans l'ombre de Piaf. It was released in November 2005 and broadcast on TSR1 and TSR2 (SWITZERLAND) as well as France3 Bourgogne Franche Comté (FRANCE). Georges Moustaki, famed performer and writer of Milord and other Piaf songs, had said: "Freshness, musicality, rhythm, talent, sensibility, emotion...Piaf would have loved to hear these songs "revisited" by Ziaf. A celebration that lives up to the genius of the great little lady." Special guest FauxMenco is a fiery nylon string guitar duo featuring Catherine Capozzi and Rafi Sofer, bringing their original mix of classical, flamenco, surf, gypsy rock and all things in between to start the night with a short set.